I have this feeling. A feeling that 2013 is going to be an awesome year… Just in general. I love going down memory lane and reminiscing about all the good times and blessings I have had in my life. I think that our emotions follow our thoughts. A feeling can be fleeting but if you let it nest it has the potential to ruin your attitude and outlook. I recently saw a memory jar on Pinterest. You write down your memories and blessings throughout the year. 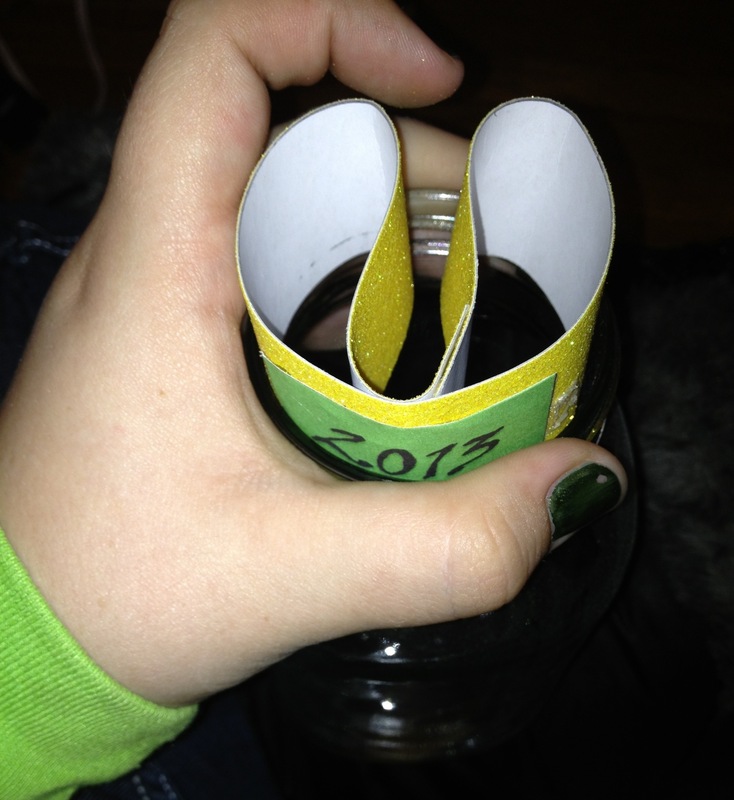 At the end of the year you take out your jar and read all the notes you made. I personally feel that we lose sight of all the good things that happen to us and focus on the bad. 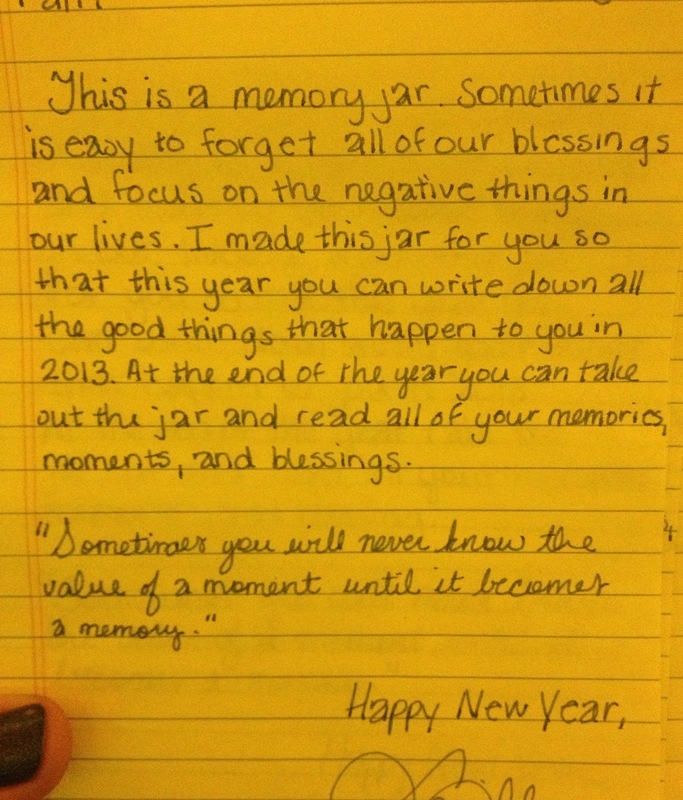 This jar was a way to remind us to focus on the good things in life. I went to my local Walmart and purchased some mason jars. I got the largest ones. Next year I may get those glass pickle jars in anticipation of many, many blessings! I had the rest of the supplies I need already. I went home and started on my project. 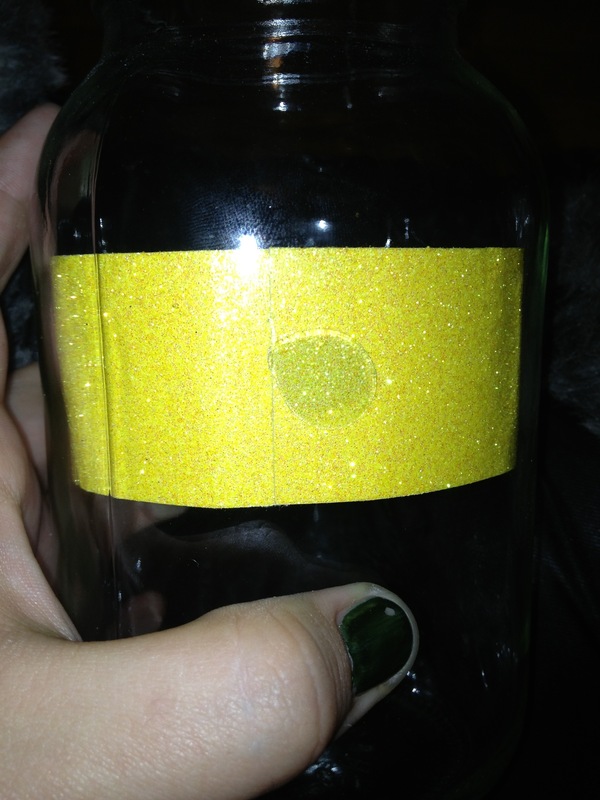 I took a glittery yellow piece of scrapbook paper for the label. The paper was not long enough to go around the outside. I decided to put it on the inside of the jar and it worked perfectly! It was rather difficult to get it inside though. 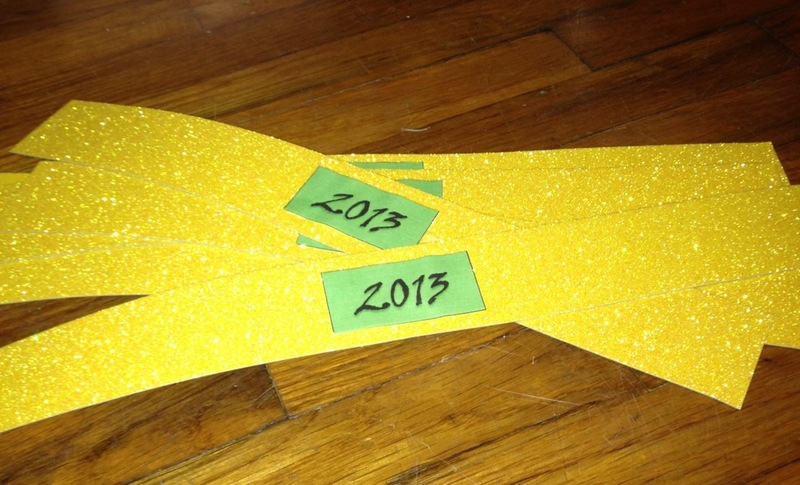 I hot glued the 2013 label to the scrapbook paper. Then comes the trick part of getting the band into the jar. The tricky part was getting the band in with hot glue and get it to stick to the glass in time before the glue dried. 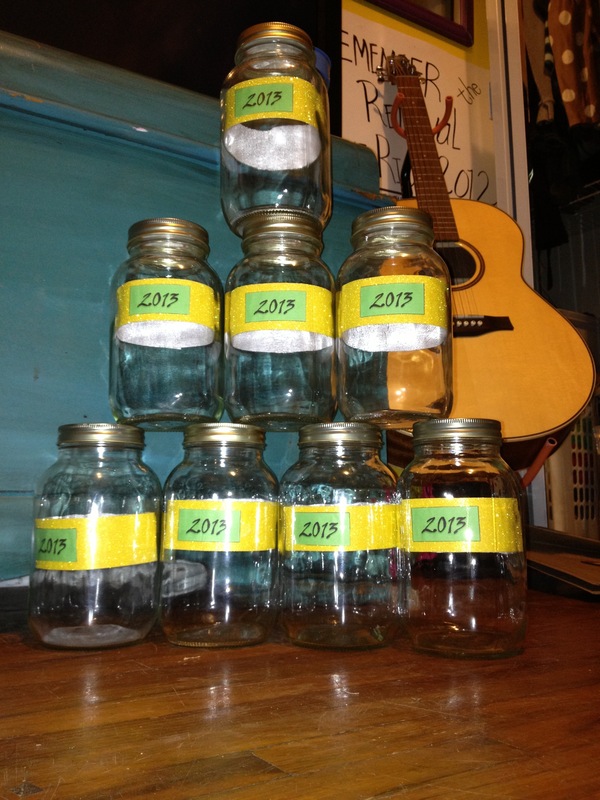 I made the jars to give to some very special people in my life. 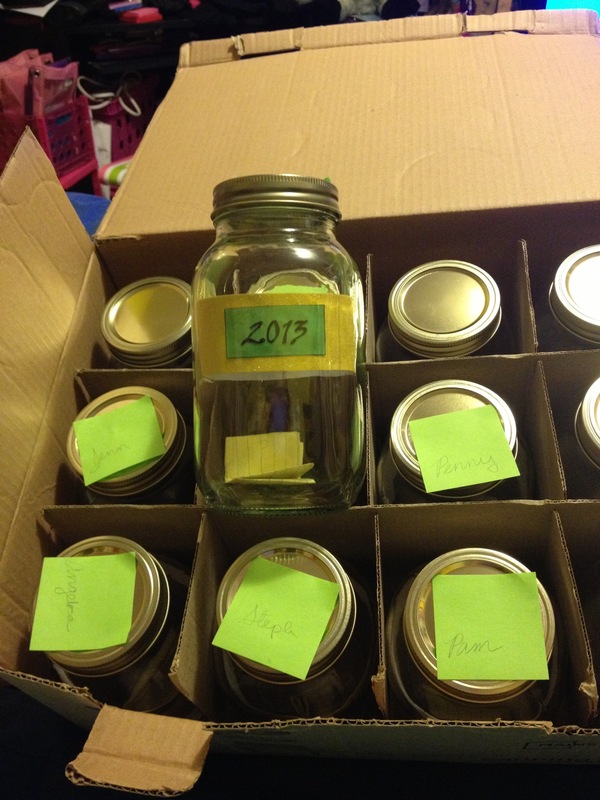 I gave out jars to a few of the people who really helped me through 2012. So a big thank you to my jar receivers for being there for me. I included a note that explained the jar. The jars were then ready to deliver! 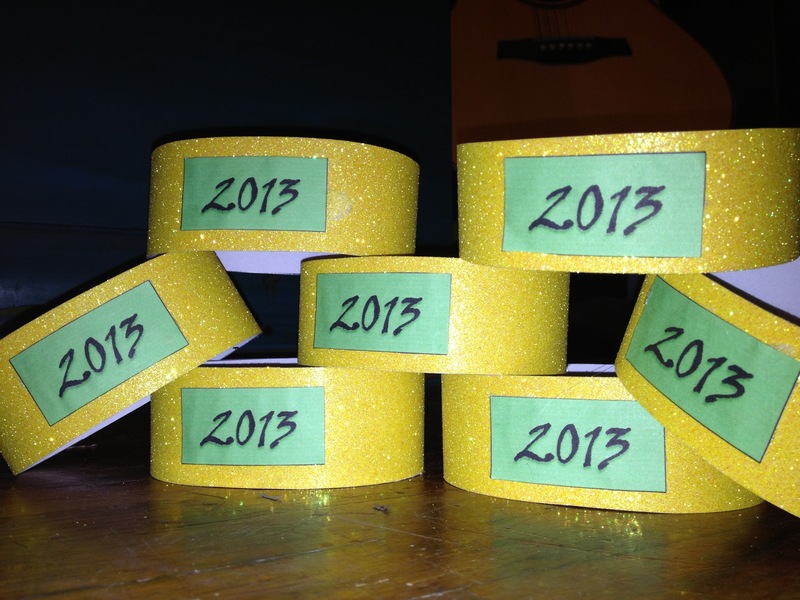 This entry was posted in my thoughts, Projects and tagged 2013, blessing, memories, people. Bookmark the permalink.